It’s Sunday and we’re a little nervous. We have no idea what we have in the pantry or fridge. This morning we woke up to 1 egg, no oatmeal and some fruit in the pantry. Mr. King put together a little breakfast from it, but it was hardly par for the course. Wow…Sundays we really feel just how much we love having a personal chef. What? A personal chef? Yes. The luxuries of having a personal chef aren’t reserved for the wealthy and famous. 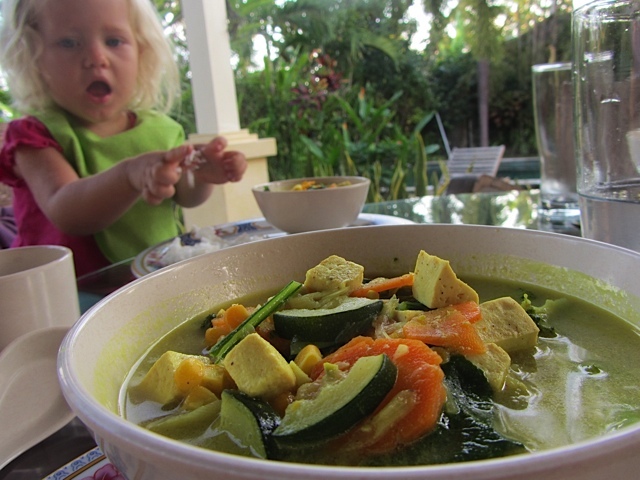 Our normal family of 4 is taking full advantage of staying healthy with a personal chef in Bali. Sunday is her day off and we usually scrap together a small breakfast and then go out to eat or order in for the rest of the day. We haven’t forgotten how to cook, we just choose not to. This is exactly how lax you get when you have an incredible personal chef. This is our second chef. The first one we hired cooked delicious food, but it was only Indonesian food and we were quickly bored with the same flavors over and over. She also didn’t understand our health concerns over non-organic, MSG and chemical additives to food. We wanted a chef that ‘got’ us and how we wanted to eat. In the short time that we’ve been here, we’ve singled out some of our favorite restaurants that served organic, raw, mainly vegetarian food and thought “Wouldn’t it be great just to get a cook from one of these restaurants?” So we started asking managers, cooks and servers if they knew anyone that worked here in the past that was looking for a job. It took one week before we had any luck, and luck’s name was Purnama.We quickly hired her hoping that the food was naturally flavorful and healthy. Luck would have it that she is amazing. 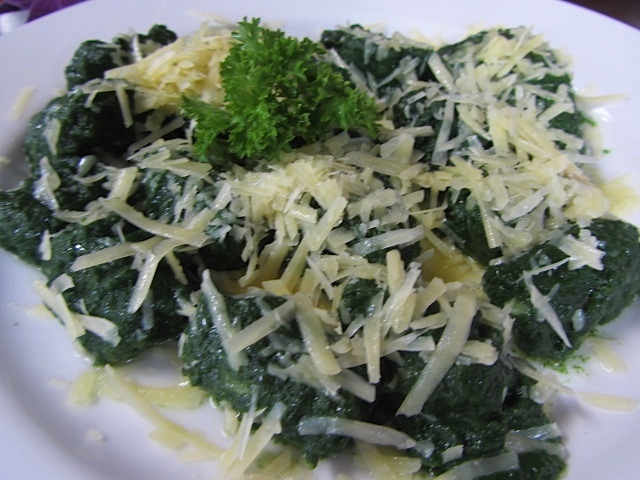 She has worked at one of the top health food restaurants in Bali for the past 7 years and can make anything on their menu, from hummus to homemade ravioli and delicious spinach and rice gnocchi. 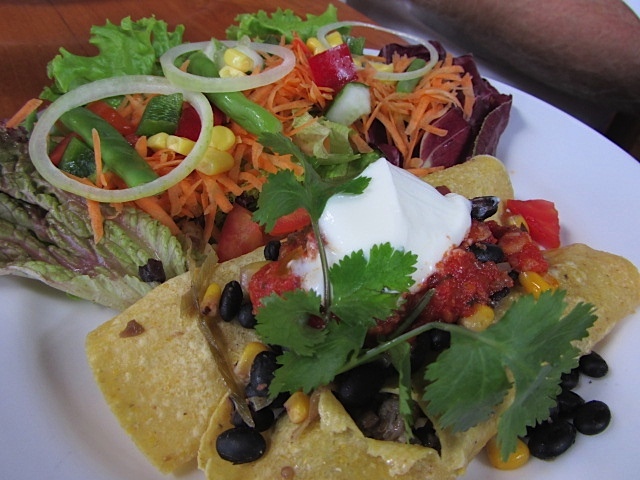 The first week, we set a menu for ourselves and each dish was mouthwatering and uber-healthy. Now, she just makes meals for us and we have no idea what we’ll be eating, but it’s always good. Our personal chef is responsible for handling all the menu planning, grocery shopping, cooking, and kitchen cleanup. All we have to do is come home, eat and then she cleans up. Most people think that hiring a personal chef is reserved for the wealthy or celebrities, but living abroad gives us the ability to hire a full time chef. There are so many advantages that our family gains from having a personal cook. It’s been two weeks since our cook has been with us and our total grocery bill has been $80 for 2 weeks of 3 meals/day for 6 days/week for the four of us. As mentioned above, Purnama knows just how much of everything to buy so there is little to no waste. She also knows where to go for the best, freshest produce and has great contacts with the local organic growers. We are also less tempted to eat out knowing that we have a fully flavorful and delicious meal waiting for us at home. Each meal we eat out normally costs us $22 for the four of us, which is so very reasonable, but it adds up if you eat out once per day or more. Eating out also requires a lot of time: time to get to the restaurant, order, wait for your food, eat and then pay and go home. Especially with little kids, I don’t want to spend my time waiting. We rarely eat out during the week, knowing that we can make up for it on Sunday. On Sunday we try new restaurants and indulge in them since it’s a treat for us. It makes the experience all the more special. I would venture to guess that we’d be eating out at least once every 2 days minimum, which equates to $90-120/week. Plus, we’d be responsible for cooking the rest of our meals and buying our food. That savings more than pays for all our groceries and our cooks salary. Part of my definition of success is to get others to do what I don’t want to do or don’t know how to do. It’s the ultimate convenience. I outsource things in my business, like graphics, some web design and marketing activities. Those are activities that I would rather not be doing with my time. I have done the same with my lifestyle. I don’t want to spend hours per day shopping, preparing, cooking and cleaning when someone else can do it for me at such a reasonable cost. The time this affords me is spent on my current best use: playing with my children, working, reading, getting a massage or sleeping. It’s a luxury few can afford in more western nations, but the cost in Indonesia is very reasonable. Having worked in a busy restaurant where the focus is on fresh, organic food, our chef buys fresh ingredients everyday and knows exactly how much to make. We rarely have leftovers. When we have friends over for dinner, we just tell her to make extra plates and sure enough, there is plenty of food yet no leftovers. In seven years working at a restaurant, she has mastered portion control and just how much of an ingredient is needed to make the dishes. Therefore, we have no leftovers sitting in the fridge for days on end spoiling. Less food waste also means that our food budget is low. 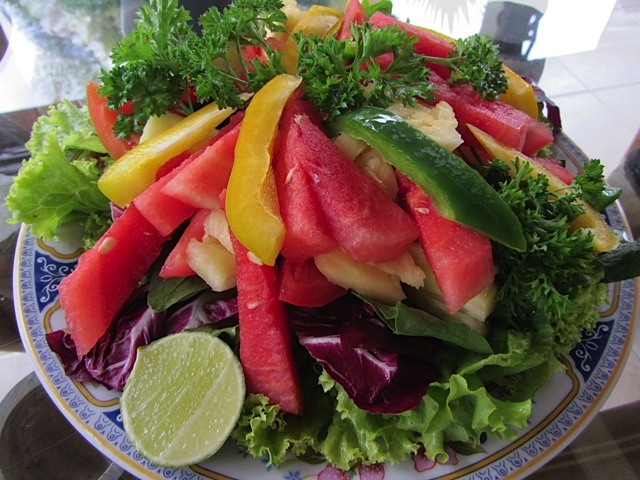 The colors in the salad are just mesmerizing! Having friends over for dinner or lunch is a no stress affair. We just tell our cook how many more people there will be and she adjusts the amount of food she is making. We are able to enjoy our friends with undivided attention since our chef is doing the cooking, cleaning and serving. It makes entertaining relaxing again. I’m a firm believer that most chronic disease starts with the way we treat our bodies. Our diet has a profound impact on how well our bodies function. I believe know that diet can cure most disease. The typical standard American diet (nicknamed SAD for a reason) is based on processed food-like substances instead of whole organic foods. In a busy lifestyle, people want convenience and processed foods are quick, cheap and easy. They may be nutrient deficient, but when you’re on the go, that isn’t something most people think about. Having a personal chef that knows how we want to eat allows us to remain healthy by eating proper, fresh foods for every meal of the day. When we are out doing stuff, instead of grabbing something on the go, we know that a fresh meal is being prepared for us at home. We’ve never eaten so much GREEN stuff before and we love it. It makes are bodies feel great! We are very grateful for our personal cook. She makes our stay here in Bali all that much more enjoyable and relaxing. Most personal cooks in Bali make $130-175 per month. We pay a little more, not because we have to, but we want to. Our personal chef allowed us to set her salary and we felt that the quality of food, the convenience and the health benefit was worth more to us. She’s happy. We’re thrilled. Life is Good. Life is Oh-So-Freakin’-Good. What if someone gifted you a year of having a personal chef….what would you do? Could you imagine having this convenience? What would you do with your time? What changes would you make in your diet?